There had been a sudden inrush of food trucks in Gurgaon, and that’s one of the many things we love about the city. The concept of food trucks has changed the way we look at street food. These trucks bring to us various cuisines across the city. We’ve compiled a list of food trucks of Gurgaon that you must check out, if you haven’t already. This food truck For the best breakfast choices, head straight to Eggjactly! From excellent salads, rolls, waffles to Mexican and Italian special dishes, they’ve got it all covered. You can find this food truck on the Leisure Valley Road, Sector 29. Sushi House Mafia is a venture by the makers of Eggjactly, so it’s easy to guess that this truck has great food for us to have. As the name of the food truck suggests, they serve everybody’s favorite Japanese food, Sushi, and that too in a wide variety. Leisure Valley Road, Sector 29 is where you can find it. 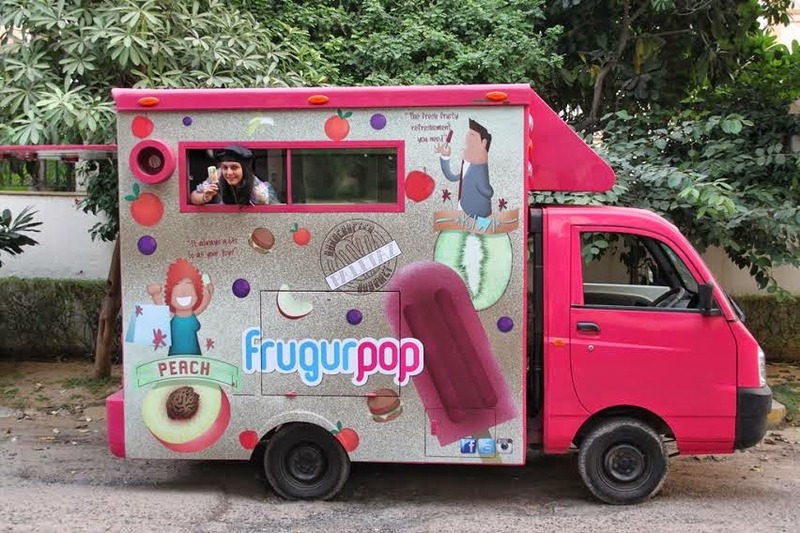 The best medicine to save us from Gurgaon’s heat is perhaps good ice cream, and Frugurpop has it covered for us. Found during the evening in Sector 57, Frugurpop has a variety of popsicles and sorbets. What The Truck brings to us the best street food. Not just that, they also cater for birthday parties and other events. They are open six days a week, from 12pm till 9pm. Sector 29 is where you can find them. The Crazy Tucker is parked in the Leisure Valley parking, Sector 29. They’re closed on Mondays, but you can find them 6pm to 11pm the other six days of the week for amazing Italian, Mexican and Chinese food. This pocket friendly food truck serves everything, from all kinds of burgers, be it green or red to hotdogs and other street food items. It’s open from 6pm till 11pm. You should definitely check this one out. It’s in Leisure Valley, Sector 29. For true Asian flavours, we know exactly where you should head. Drifter’s Cafe serves Malaysian, Thai, Indonesian, Japanese and more cuisines, bringing to us the best Asian grub on wheels. You can find this food truck near Huda City Center Metro Station in Sector 29. Without having to spend too much, you can have wholesome Indian combos like Vegetable Thali, Choley Rice, Kudhi Rice, Rajma Rice and more here at Food Island The Truck. They have snacks and refreshing drinks covered too! You can find FITT near Artemis Hospital in Sector 51. Flavour Lab is the place you must visit if you fancy fusion food. Deep fried Oreos? Sure! They’re very experimental with the food the serve and the menu is surely full of surprises. This food truck is stationed near Unitech Trade Center every Tuesday, Wednesday and Thursday. Everybody likes the Indian street style Chinese food sometimes and Hi-Fi Desi serves the best of that kind. To curb your Indianised Chinese food cravings, find the Hi- Fi Desi food truck in Sector 10A open from 5pm till midnight. This food truck sure is one of the most popular ones in Old Gurgaon.